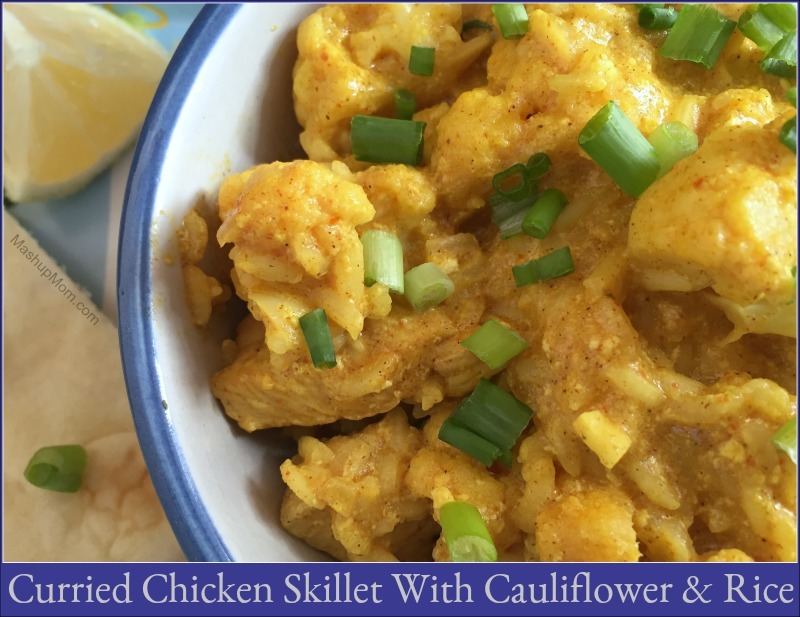 How about an all-in-one Curried Chicken Skillet With Cauliflower & Rice today? There’s nothing like a one-pot meal for an easy (and flavor-packed!) 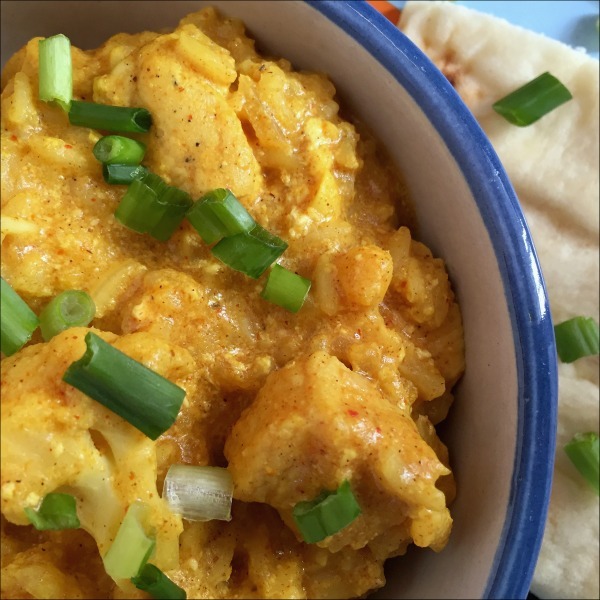 weeknight dinner, and this chicken curry really hits the spot on a chilly evening. Change up your normal weeknight meal routine! 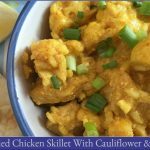 In grand Sunday Scratchups style (your weekly recipe from scratch around grocery sales and affordable ingredients), boneless skinless chicken breast and cauliflower are both going on sale at ALDI this week — and this easy curried chicken & cauliflower is a great dish to try out when cauliflower is seasonally on sale. Season chicken on both sides with sea salt & pepper, then chop it into bite-sized pieces. Heat olive oil in a large skillet over medium-high heat until shimmering. 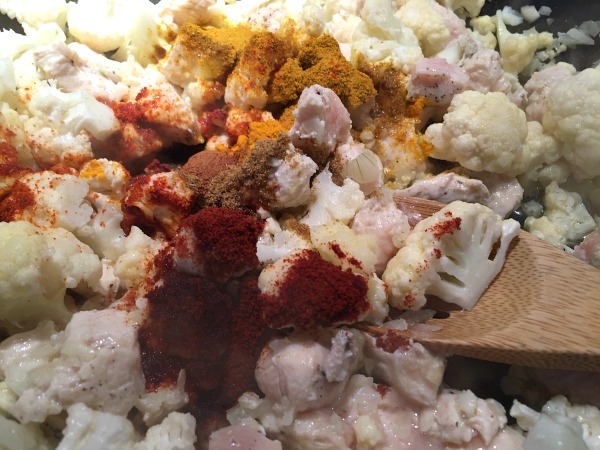 Add chicken, onion, garlic, and cauliflower, then saute for about five minutes, stirring occasionally. Stir in spices and saute for another two minutes. Cover the skillet with a tightly fitting lid and let everything simmer over medium-low heat for 25 minutes, or until rice is done and has absorbed most of the liquid. Remove skillet from heat and stir in the lemon juice. Replace lid and let chicken curry sit covered for 5 more minutes to thicken up (it will still be goopy; you want some sauce in the mix here), then serve your chicken cauliflower curry skillet topped with chopped green onion, parsley, or cilantro. Note: This was tasty as written, but next time I’d probably add in a little ginger as well — I just didn’t think of it at the time. 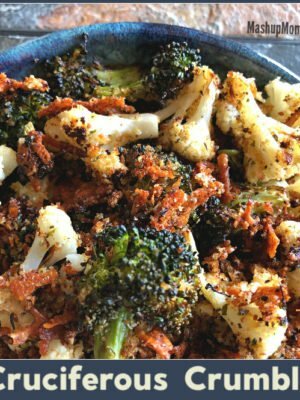 As written, this recipe also has a slight crunch to the cauliflower — so, if you like yours soft, either cut it into smaller pieces so it cooks more quickly, or pre-cook slightly. You just need 45 minutes to make this shortcut curried chicken skillet recipe, which is both super filling and super flavorful. 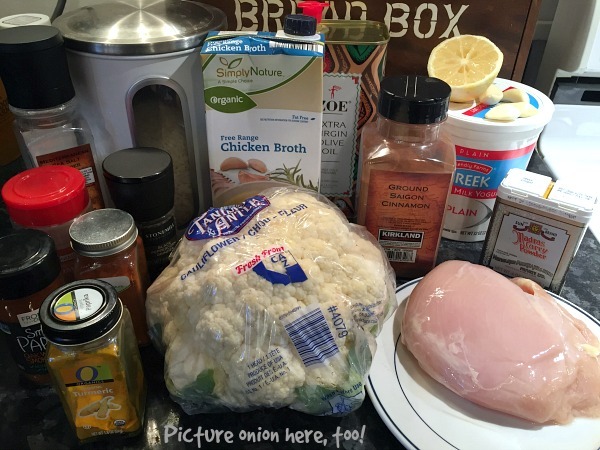 I served ours with naan because I found a pack on half off clearance at ALDI, but the rice makes this one pot curry filling enough by itself — And, if you don’t serve yours with naan, the curried chicken itself is naturally gluten free. So good, and the leftovers make a great lunch the next day, too. You just need 45 minutes to make this shortcut curried chicken skillet recipe, which is both super filling and super flavorful. This was tasty as written, but next time I'd probably add in a little ginger as well -- I just didn't think of it at the time. 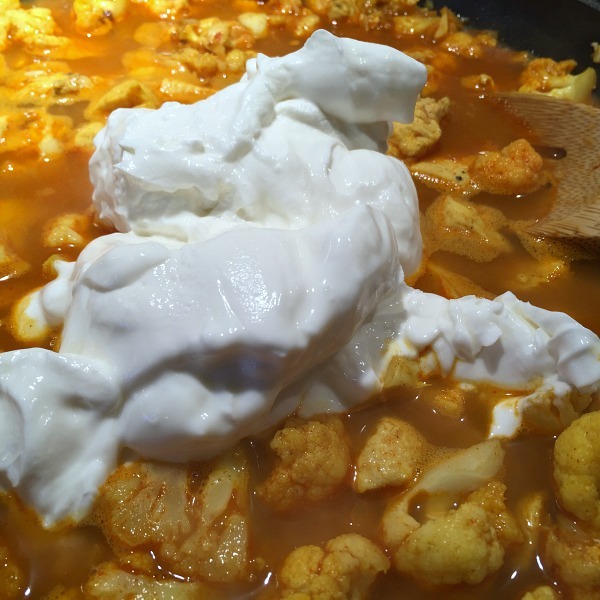 As written, this recipe also has a slight crunch to the cauliflower -- so, if you like yours soft, either cut it into smaller pieces so it cooks more quickly, or pre-cook slightly. And now I’m going to try your cashews idea, too, yum. Normally I am lazy about leaving reviews, but this one was too good. Very simple to prepare, one pot meals are the best. The yogurt adds a creaminess that cannot be matched by coconut milk. I substituted mushrooms for Cauliflower because I cannot have it. Everything else was by recipe. Thanks! So glad you enjoyed 🙂 — I like the extra creaminess and tang from the yogurt better as well. This was so tasty! 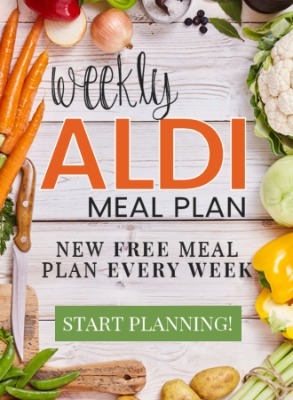 I would never have tried this on its own but it was part of your weekly ALDI meal plan (which we are LOVING, btw!) and was a great chance to get outside my comfort zone. I had no issues with goopiness (used full fat greek yogurt). On the contrary, it was creamy, smooth, and tasted amazing! This recipe will go into my binder for sure. I don’t remember ever having a dish similar to this. So good and VERY filling. 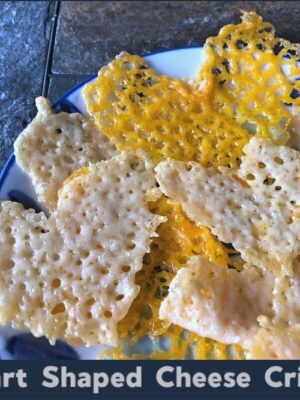 Love the pairing with the Naan bread which is a hit in our home. Even my 2yo wanted more! This was awesome. Excited to add some chickpeas per a previous review. An Aldi was just opened near me. Love it! This recipe is cooking right now. It smells so good. I’m sure it will be very flavorful. Is this spicy as written if I omit the cayenne pepper? I am sensitive to spice so was not sure if the curry powder amount makes the dish spicy or not? Thanks! Thank you! Also you said you would add ginger next time, about how much would you add? Just a little — Like 1/4-1/2 tsp ground ginger. 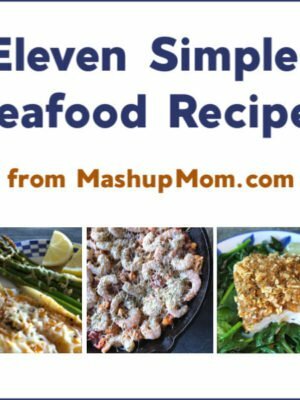 Would this meal freeze well? I haven’t tried. I should think so but it might get grainier on defrosting because of the yogurt in there. Let us know if you try it! Could I use a dutch oven instead of a skillet? 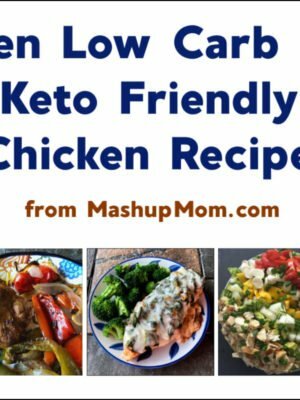 I’ve never tried — I’m not sure if it would come out quite the same, and I’d definitely check to make sure that the chicken is cooked all the way through at the end if you decide to give that a try. I cooked mine in a Dutch Oven on the stove top! I use it for basically everything.